Müller Milk & Ingredients (MMI) CEO Patrick Müller has confirmed completion of Britain’s largest ever dairy industry integration, set out his strategy for the future of the £1.7bn fresh milk, cream, butter and ingredients business, and confirmed a key executive board appointment. Brian Watson has been appointed as Chief Finance Officer at Müller Milk & Ingredients. He joins the business from Marmon, a $7.7bn Berkshire Hathaway company operating in the supermarket and food service sector. 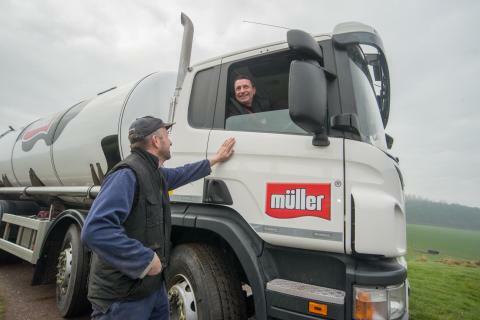 The appointment comes as MMI confirms completion of the biggest integration the UK dairy industry has ever seen - merging Dairy Crest’s dairy operations into Müller’s existing fresh milk operation to create Müller Milk & Ingredients, which purchases 25% of Britain’s farm gate milk. “I am delighted to welcome Brian as we enter the next phase of our development. This is a key appointment and his experience will augment an executive team who are highlymotivated to make our vision a reality. “This business acquired Dairy Crest’s liquid milk dairies to build scale and unlock greater efficiencies and benefit for customers. Bringing these two very large organisations together has been a huge and unprecedented task with multiple challenges; requiring the alignment of multiple systems and processes. “I am delighted to say that our team has now delivered a single organisation and platform for the future, on the schedule which we initially set out. We now have a competitive and unique proposition having invested heavily in highly efficient factories which optimise energy, water and wastage; and in a comprehensive logistics network. “We have acquired our own blow moulding facilities and we are determined to lead the agenda in plastics through increased use of recycled materials, light-weighting and to drive further innovation. “In agriculture we are innovating strongly to ensure that dairy farmers can opt to protect themselves from the corrosive effects of extreme market volatility, and in farming’s next generation so that they are equipped and inspired to run dairy businesses which become exemplars for our industry. “We are now ready to realise our vision to be Britain’s dairy leader. That means achieving a sustainable and progressive business and leveraging the capability we now have to execute with excellence, every time. We know that great customer service is a pre-requisite. “We will help customers with whom we have strategic partnerships to deliver distinctive and ownable propositions, including added value products in the fresh milk aisle so that they can meet the promises they make to consumers. We have the capability, flexibility and management autonomy in the UK to do this. “We will also target profitable growth in channels and sectors of the fresh milk category where we currently don’t have a presence and we will, of course, leverage the Müller brand, a top 10 FMCG brand in the UK. Müller UK & Ireland is wholly owned by the Unternehmensgruppe Theo Müller which employs 27,500 people throughout Europe. 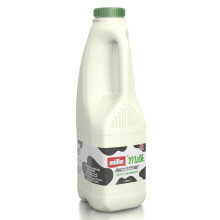 In the UK, Müller develops, manufactures and markets a wide range of branded and private label dairy products made with milk from more than 1,700 British farmers. Müller Milk & Ingredients is Britain’s largest producer of branded and private label fresh milk, cream, butter and ingredients products, with a network of dairies and depots servicing customers throughout the country. Müller Yogurt & Desserts is the UK’s leading yogurt manufacturer responsible for major brands like Müllerlight, Müller Corner and Müller Rice. It produces chilled desserts under licence from Mondelez International and supplies the UK private label yogurt market from a dedicated, state of the art yogurt facility. Milk & More delivers daily essentials to more than 500,000 homes in Britain, via a network of 57 local fulfilment centres. The milkman is arguably the original home delivery service and Milk & More is ensuring that this great British tradition continues to flourish. Müller is an Official Supporter of British Athletics and Athletics Ireland. With branding and activation rights for four events in 2018 and three events in 2019, Müller aims to empower consumers to make active and healthy lifestyle choices. 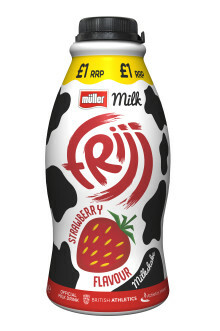 Convenience stores and food service businesses are to benefit as Müller introduces FRijj with a longer lasting ambient recipe for the first time. 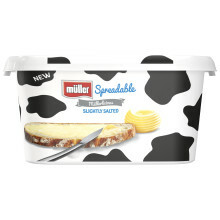 Müller, the UK’s seventh most picked FMCG brand , is set to boost the resurgent butter category with the launch of Müller Spreadable, its first ever branded spreadable in the UK. Müller Milk & Ingredients has confirmed details of a new initiative designed to help British dairy farmers manage the impact of extreme farm gate milk price volatility. Müller, Britain’s biggest producer of fresh milk, butter, cream, yogurt and desserts, has confirmed its intention to acquire the capability to manufacture its own fresh milk packaging in the UK. Müller has published details of its ‘Next Generation’ programme for 25 Müller Direct farmers – and confirmed that it will include face time with elite athletes, as part of the company’s status as Official Supporter of British Athletics and Athletics Ireland. A £15 million project to substantially upgrade Scotland’s largest fresh milk dairy in Bellshill and secure 265 jobs has had its completion marked by a visit from Scottish 400 metres hurdles record holder and multiple medallist, Eilidh Doyle. 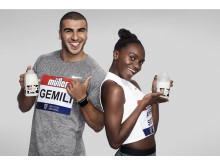 The UK’s most chosen dairy brand has extended its successful partnership with British Athletics until the end of 2021. Britain’s leading producer of branded and private label fresh milk, cream, butter and ingredients products has appointed Brendan Power as Commercial Director.